For once, I won’t write about a day here but about a week: this week is the Open Access week (OA week). In this fourth edition, it’s not time anymore to explain one more time what is Open Access (but if you still want to read about it, read the Wikipedia article or Peter Suber’s overview). This year, this week is defined as “an opportunity […] to continue to learn about the potential benefits of Open Access, to share what they’ve learned with colleagues, and to help inspire wider participation in helping to make Open Access a new norm in scholarship and research“. I was curious about what is the state of Open Access in Belgian universities. On the OA week website, only two Belgian events were registered: one workshop centered around pending issues in the management of institutional repositories (organized by the national science funding body – FNRS) and one stream of activities at the University of Liege (yipee, ULg is my Alma Mater!). The new thing (at least for me) is that both event are either captured on video or launched with a video. 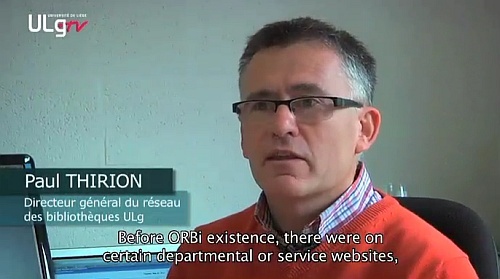 The launch video from the University of Liege includes interviews with researchers telling how Open Access helps them and others (it’s a pity the entry page for its library network is still the same as ten years ago). If you look for the information, you’ll find that the University of Ghent is also participating in the Open Access week, with two professors describing Open Access in videos in Dutch and a website about it (in collaboration with the ULg): http://www.openaccess.be. Other Belgian universities usually support Open Access without any specific action about this week (except ULB with a recap mainly on the financial benefits). Is it a sign that Open Access is losing momentum or just became part of everyday life in universities?